Digital Solutions / Inmate Telephone, Inc.
Ability to view, scan and/or import documents and index them remotely. 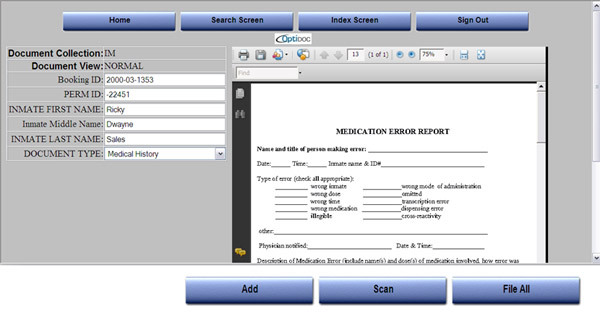 Uses the OptiDoc Application Integration software to extract data from the Offender Management System screen when indexing. This eliminates the manual indexing of documents. Uses extensive document security to assure that documents are retrieved only by users authorized to view the document. Ability to view & tile multiple images. Email, fax or print from the desktop using networked devices and software. Ability to find and display related documents. Any Doc Type - Medical Records, Arrest Records etc. Inmate Folder - Collection of document types based on Inmate permanent ID. Doc Date - Doc Date, Create Date, Finish Date & Change Date. Keywords - Logical Document Index Data. Ex. Inmate D, Intake Date, etc. Boolean Search criteria - options include: =, not =, >, <, Begins and Contains. The search below illustrates how a user would search for an inmate document by first selecting the DSI Document button and then selecting the appropriate document type from the pull down list. Available Document Types change to reflect the data shown on the screen display in the OMS System. There are several methods for supplying keyword data when scanning or importing documents. This keyword data is used later to retrieve the inmates individual documents or the Inmate Folder. Pull all keyword data from the Offender Management Screen that is active. This is the preferred method as it requires no data entry. Print a barcode that is scanned along with the document(s). When you enter the inmate permanent ID number all other index information is automatically filled in from data contained in your Offender Management System.